The aeronautical correspondent of The Times, London, calls attention to the fact that the British Overseas Airways Corporation has issued a new type of world map, designed to “re-teach” geography in a form more suited to the coming “Air Age”. It points out that because the earth is a sphere and maps of the world are flat, every type of map gives a distorted picture. 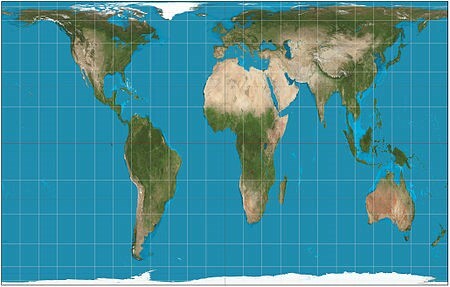 On a Mercator projection, now commonly used for world maps, the distortion increases according to the distance from the equator. For instance, Greenland is shown as being about the same size as South America, whereas its area is only about one tenth of that continent. Distances between widely separated places also become exaggerated, particularly in high altitudes. 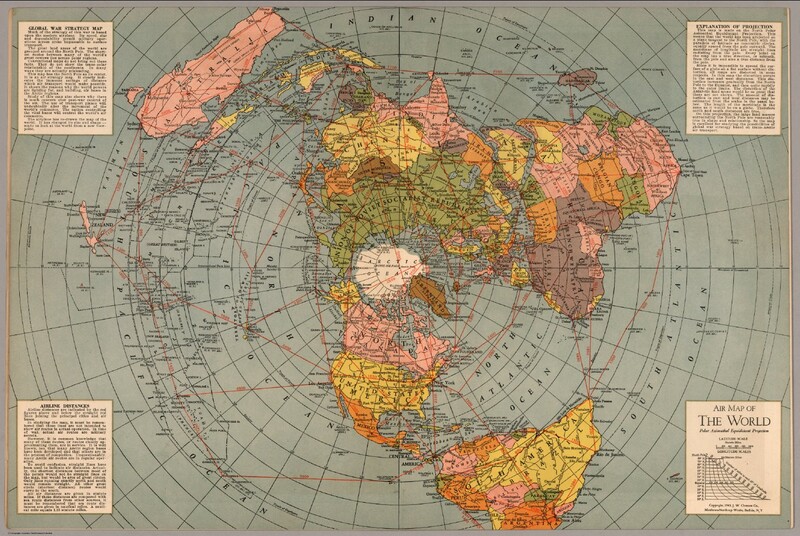 At present, maps drawn on the Mercator projection are used for both sea and air navigation, but whereas ships must follow tracks which may involve long detours to avoid land masses, the aeroplane can follow the shortest route –a straight line over the Earth’s surface. Now that airliners are being designed to fly non-stop over long distances, a new type of map is needed which will enable the intending passenger to read accurately the distances he has to cover. To indicate the distance from London of places all over the world which will be served by British air services, the British Overseas Air Corporation has prepared what is known as an azimuthal equidistant map centered in London. Straight lines drawn from London to any other point on the earth’s surface will show accurately the distances separating them, though no necessarily the route which will be followed. 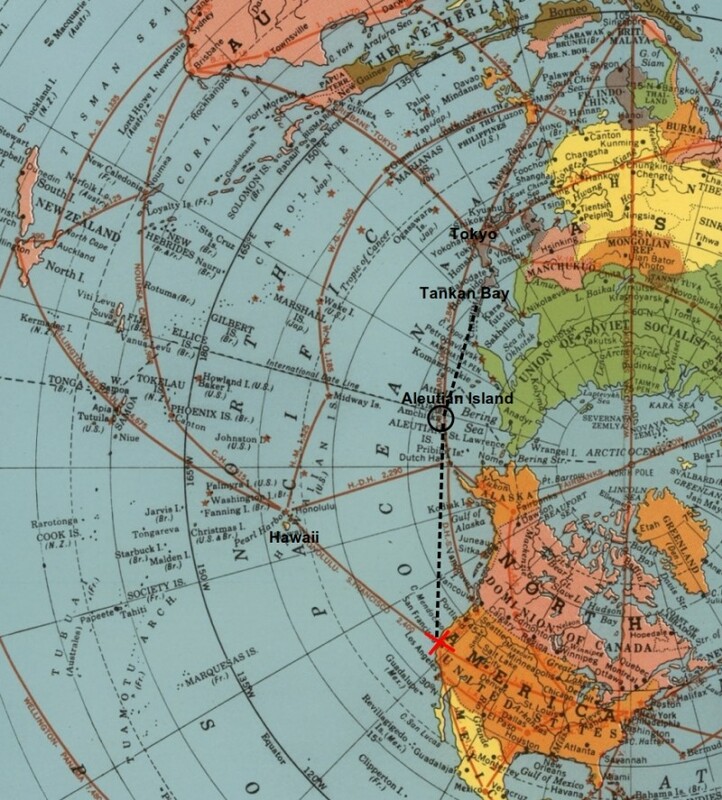 On the azimuthal equidistant map a straight line indicates a Great Circle course, but such a direct route is not likely followed by air services in the years immediately after the war unless it happens to serve big centers of population or important business areas. Such routes, in general, will not be used for air services until there have been further development in the speed, range and economies of long distance flying. The British Overseas Airways Corporation object in producing an “Air Age” map now is to encourage the teaching of this new conception of geography in schools, so that boys and girls will grow up air minded. This map is of high quality I got on Ebay and shows the actual miles distance of world’s major countries and cities from point to point. 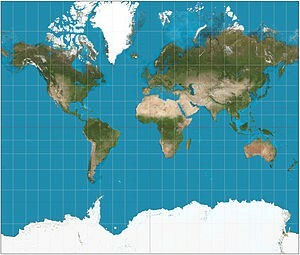 The Mercator Projection Map is the most common map used in schools, textbooks and relied upon by millions of people every single day. 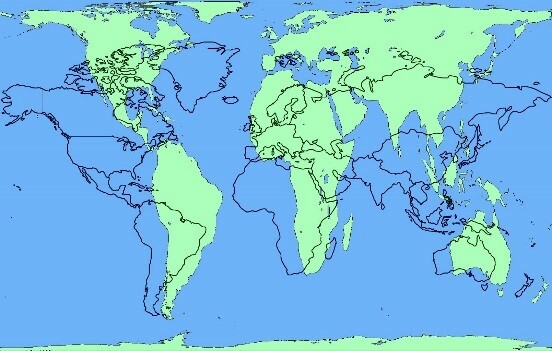 The true scale of land masses relative in size and shape to one another are all wrong and gives us a very distorted representation of the world. The traditional “Mercator Projection Map” has a cultural and ethnic bias because of the relative and distorted sizes of the land masses creating a Eurocentric bias favoring Western civilization and greatly minimizing the size of South America and Africa. The Mercator Map represents Greenland and Africa as being roughly the same size however in reality, Africa is 4 times as large as Greenland. Africa is in fact 30.221 x 1000 sq. Km. Man U really do got a lot of spare time to shill around in truther’s blogs I can’t believe you still believe in this spinning ball !! If the premise that the world is, indeed, flat, then creating an accurate map should not be all that difficult. True, an accurate map which is necessarily 2D is nearly impossible to represent a sphere. It is this inability to find an accurate map that makes me question the FE concept despite seeing many logical conclusions with regards to cosmology, local observations, physics anomalies, etc.